I am always looking for a challenging activity for my son who is always conquering activities and getting bored. One thing he has always liked to do since he was very young is build with blocks and follow a pattern to build something (architect someday, maybe....). So when I saw the Mental Blox from Learning Resources, I knew they were going to be the perfect game for my son to play! And I was SO RIGHT! 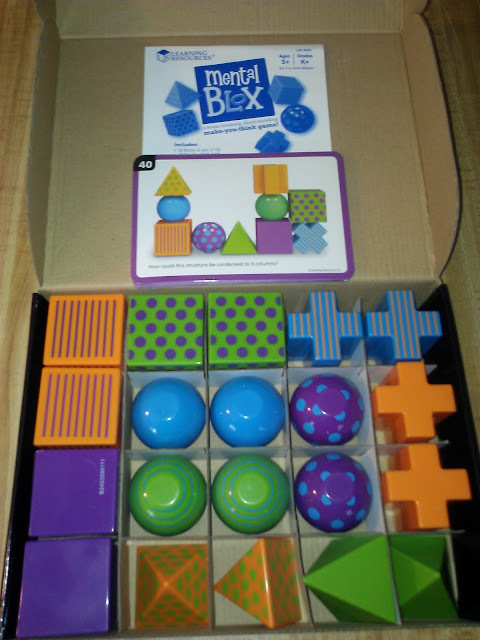 My son instantly LOVED the Mental Blox that we received for review! Fire up the strategic problem solving with the Mental Blox Game! This game is aimed for Ages 5-13 but my son is 3 and can follow the patterns perfectly so ages may differ! Stack, pattern, and match the multicolor shapes, but don’t be fooled by appearances: these endlessly enjoyable blocks mean brain-boosting business! Twenty activity cards keep strategic thinking skills in tip-top shape. Re-create a hidden arrangement or listen to verbal instructions. Set of 20 plastic, chunky pieces feature 4 different shapes and 3 different attributes for a real challenge! I loved that this game is so versatile. It can be played with multiple players when my son has friends over or it can be played alone for days he is by himself. It also can be played with younger and older children. For younger children like my son, they can simply just build the picture they see on the card. For older children, they can have an extra challenge by doing it in a time limit or answering the questions on the cards. I love that this game will be used for MANY years to come and with all my children no matter what age! 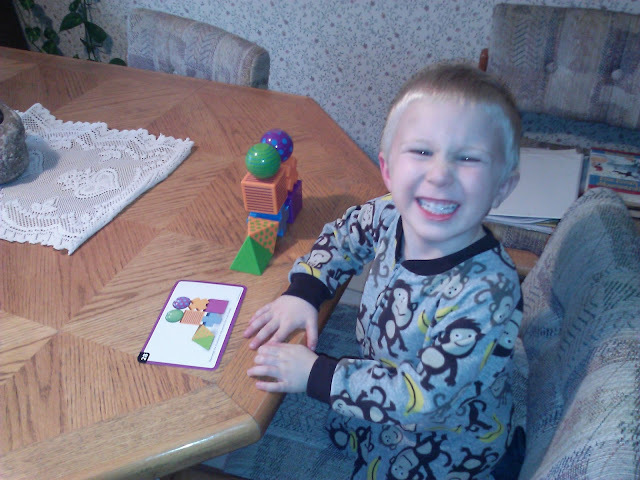 My son loves building and is so proud when he gets the blocks built exaclty like the card! I love watching him learn and have fun at the same time! I highly recommend! Win It: Learning Resources is generously offering (1) Mental Blox Game to a lucky winner!